Section 504 is a civil rights law that prohibits discrimination against individuals with disabilities. Section 504 ensures that the child with a disability has equal access to an education. Section 504 requires that school districts provide a free appropriate public education (FAPE) to qualified students in their jurisdictions who have a physical or mental impairment that substantially limits one or more major life activities. The child may receive accommodations and modifications. IDEA (the Individuals with Disabilities Education Improvement Act) only applies to students who require special education because they have one of the specified types of disabilities. Students who qualify under section 504 must have a 504 plan that outlines the services to be provided. Some students will also qualify under the more stringent IDEA. These students will have an IEP (Individualized Educational Plan) rather than a 504 plan. Unlike the Individuals with Disabilities Education Act (IDEA), Section 504 does not require the school to provide an individualized educational program (IEP) that is designed to meet the child's unique needs and provides the child with educational benefit. 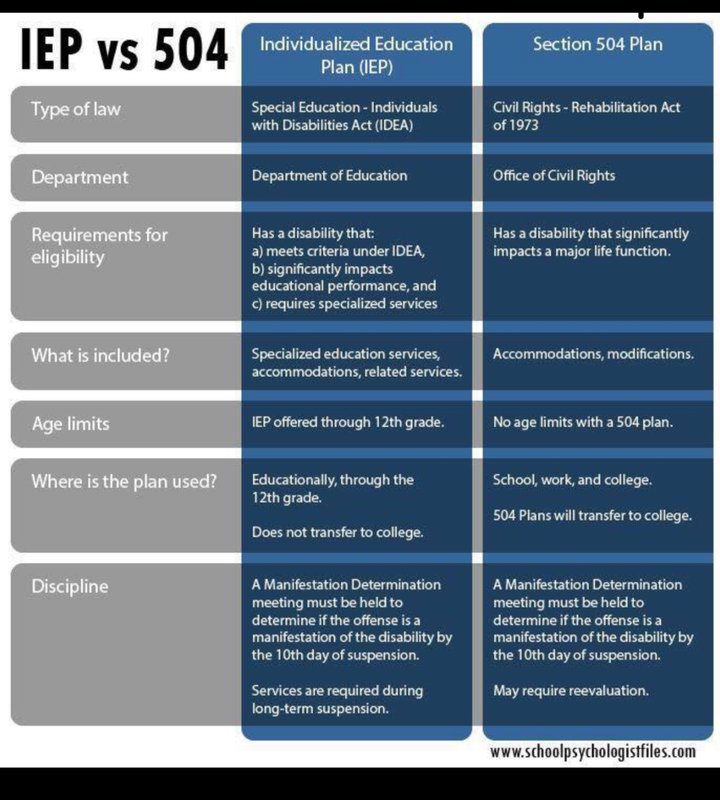 A student cannot have both a 504 plan and an IEP. If the student is eligible for special education, that's what he/she gets and all the supports and services needed must be provided as related services attached to the IEP. Additionally, the parent cannot opt for a 504 plan if the student is eligible for special education, since the school is required to provide an IEP to a student who is eligible for one because of the greater rights and entitlements under the IDEA than under Section 504; a school district must comply with more procedural requirements and formalities under the IDEA. Click here 504 Accomodation Checklist for a list of areas of concern and possible accommodations that may help your child succeed in the classroom.